A lazy way to make a mayonnaise-style spread that has a sharp tang to it – and is healthier than the real thing – is to mix yogurt with olive oil. If you spread this on a toasted baguette and top it with a Greek salad made with squeaky slices of hot Halloumi, you'll have a very agreeable supper. Preheat the grill. Place all the ingredients for the garlic yogurt in a bowl, season with salt and mix together. In a separate bowl, mix the cucumber with the preserved lemon, parsley, mint, peppers and half the oil. 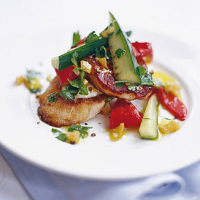 Cut the Halloumi into 8 slices and heat the remaining oil in a frying pan over a high heat. Cook the Halloumi slices for 2 minutes each side until dappled golden brown, then mix with the cucumber, lemon and peppers. Toast the baguette under the grill until golden. Spread with the garlic yogurt and top with the salad.